Much has been written by organizations such as the CDC and OSHA concerning the handling techniques needed to properly handle surgical sharps during use. This information is 100% focused on preventing injury to healthcare professionals and patients. In other words, the focus has been on what sharps can do to people when improperly handled. Cadence is the leading provider of custom surgical sharps for medical device OEMs. As the Center Of Excellence for incisional devices, our core competence is providing expert solutions for surgical cutting, piercing, and delivery. Our goal is simple - to enable better patient outcomes through innovative incision technologies. In order to enable better patient outcomes, we focus on assuring the highest quality products get to the ultimate patient. This means we must focus our efforts on what people can do to sharps during manufacturing and assembly. First understanding that any material that comes in contact with cutting blade edges or needle tips has the strong potential to damage the component. For this reason, all processes and material handling following edge or tip generation should be designed and executed in a way that prevents any contact with other materials or surfaces. Inspection techniques need to incorporate non-contact measurement means. This eliminates any potential for hardened measurement tools (such as calipers or micrometers) coming in direct contact with the fragile features. Tooling used to locate sharps during subsequent laser welding, overmolding, forming, or cleaning processes needs to provide large areas of relief for sharp or pointed areas. 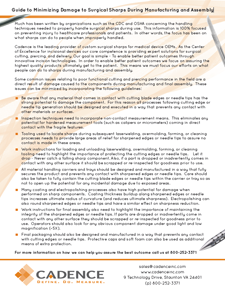 Work instructions for loading and unloading laser welding, overmolding, forming, or cleaning tooling need to highlight the importance of protecting the edges or points. If parts are dropped or come in contact with any other surface they should be scrapped or re-inspected for goodness. All material handling carriers and trays should be designed and manufactured in a way that prevents any contact with sharp or pointed areas. Many coating and electropolishing processes also have high potential for damage when performed on sharp components. Coating thickness along edges or tips increases the ultimate radius of curvature (reduces sharpness). Electropolishing can also round the edges and tips and have a similar effect on sharpness reduction. Work instructions for final assembly also need to highlight the importance of maintaining the integrity of the edges or points. If parts are dropped or come in contact with any other surface they should be scrapped or re-inspected for goodness. Operators should also look for any obvious component damage under good light and low magnification. Final packaging should also be designed and manufactured in a way that prevents any contact with sharp or pointed areas. Protective caps and soft foam can be used as additional means of protection.